If you talk about the IRS don’t do it via email or text—the agency you mailed a check to this week can eavesdrop without a search warrant or probable cause. Since 2009 the IRS has held the position that the Fourth Amendment does not protect electronic transmissions. The Stored Communications Act provides insufficient Fourth Amendment protections and the Supreme Court needs to make a clear statement against the infringement of Fourth Amendment rights by agencies like the IRS. But unfortunately the Court declined the opportunity to do so on April 15th, perhaps the Justices were too busy filing their taxes, when it refused to hear Jennings v. Broome, which would have allowed it to decide on this matter. To review, the Fourth Amendment reads, “The right of the people to be secure in their persons, houses, papers, and effects, against unreasonable searches and seizures, shall not be violated, and no Warrants shall issue, but upon probable cause, supported by Oath or affirmation, and particularly describing the place to be searched, and the persons or things to be seized.” Electronic transmissions, it would seem, fall under the category of ‘effects’ or ‘things.’ But the IRS does not seem to think so even when the Sixth Circuit Court of Appeals agrees that the Fourth Amendment extends to emails. (U.S. v Warshak). 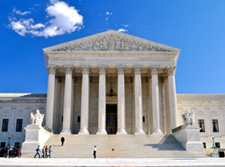 In Katz v. U.S. (1967) the U.S. Supreme Court ruled that a person is protected from a search when that person expects privacy in the thing being searched, and society believes that expectation is reasonable. The Court extended Fourth Amendment protections to GPS tracking of automobiles, a technology that predates the Fourth Amendment by two centuries, in U.S. v Jones (2012). In this case the Court said that even if a person is simply borrowing a car that they have a right to expect they are not being tracked by a law enforcement agency via GPS. If a vehicle is considered a private place then so too should be a computer in a home. Even with recent examples of emails being hacked and publicized fresh on our minds most people still consider their emails to be a private matter and therefore come under Fourth Amendment protection. Protection against unjust search and seizure is what allows us to enjoy our life and liberty without threat of government intervention or infringement. It is the touchstone of constitutional liberty as it keeps the government from creeping into our personal effects without warrant, cause or legal justification. The familiar strands that run from common law to the U.S. Constitution and Fourth Amendment should give confidence to U.S. citizens that we are the inheritors of a government and values that are not the product of radical revolution or reactionary politics but of long-tested and persistent truths established through practice, tradition, and right reason. To protect what we have been given we must not rely just on institutions and laws but must cultivate the character that is required to appreciate and protect what we have been given. We as citizens must bring pressure on our elected and appointed officials to make sure we remain a nation of laws and not of men.